I've driven past this place countless times, but it's always just as you get out of the London/Croydon traffic and you feel like you're about to start motoring so it's a hard time to stop. But this time we stopped. And it was good. Stopping instructions: 1. Look out for this sign. 2. Order this. 3. Die happy. This really is a large and high quality ebcb. This a proper cafe, workers and drivers come in here. They want feeding proper food. Nothing is drizzled on anything. Everything flat is a slab, everything liquid is in a bucket, everything else is a pile. Marvelous. Look at those chips! Huge. Crunchy. Soft. Delicious. 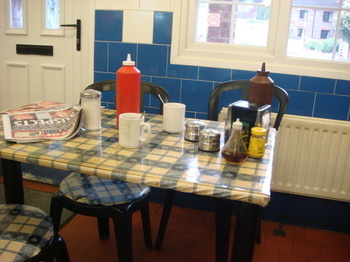 And the condiments are comensurately huge. (Is that a word?) 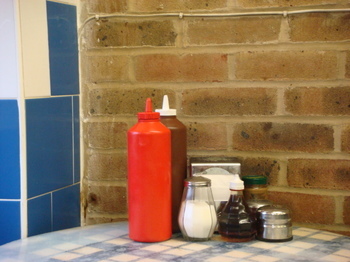 You could strap a command module on that sauce bottle and fly it to the moon. The two canonical menu-types. The lettery-pin-board thing and the day-glo stars. I want all of these things. And look - kippers! You don't see kippers often enough. 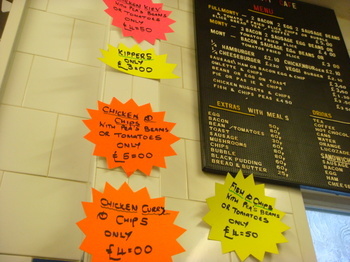 I'd have had those if this blog had been called kippers.com. Perhaps it should be. Someone's not going to manage his chips. No pudding for him then. You could sit here all day, if there wasn't a job of work to be done. Brilliant place. Although it’s “Croydon” and “Couldson”. No “e” in sight. I had to look up kippers to know what they were. How are they usually served? I know I've asked before, but each new entry is like a wave of nostalgia sweeping over me. Is there going to be a new book? I read the first one while at university and it inspired me to find places around Lancaster. It was the most fun way to spend the cold winter mornings, just wandering round hoping to find somewhere new. I did find a few pretty decent places - one of which I just really can't doubt is one of the best places in all the world. C'uh this is making me emotional. MMmmmm breakfasts. well bless you for your thoughts Chris, very kind. I don't think there'll be a new book until Harpers have sold the 15,000 copies of the old one still sitting in a warehouse. Which seems reasonable. I'd love to know about the places you've discovered though. I seem to be having a bit of a drought. What a brilliant blog! 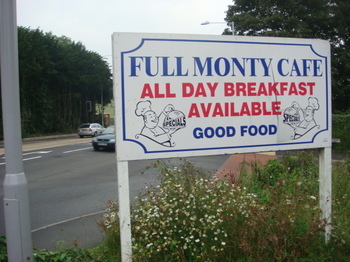 Not sure I'll be stopping at the Full Monty Cafe! - Jacks is a good hangover cure though! 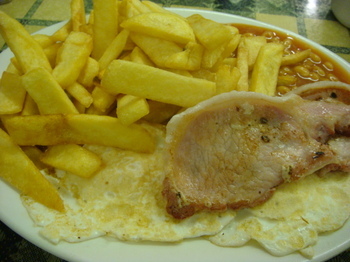 The words "All day breakfast available" are some of the finest in the English language. Okay Russel, I'm sure you're a man who enjoys a challenge, especially when all it involves is good food. So I will challenge you! And since you mention you've hit a drought, it's a challenge well worth taking up whenever possible (if ever possible :( ). Now, just to qualify the information I'm about to give and taking into consideration what you have said about the area (and in *most* cases I agree with you), I'd just like to mention that I've been to several of the places in your book and I've had mainly very positive experiences (esp Antonio's in Manchester). So I think I understand your position on good cafe food/experience as much as anyone. There is a place that shines like a beacon of English goodness, that'll give any breakfast lover a guaranteed unforgettable experience. It's not worth me trying to put it into words because I'm not a poet and I'd not do it justice. Lets say though that this place isn't just better than anywhere I've had breakfast but better than anywhere I've ever eaten. The quality and QUANTITY (It is ridiculously huge) is like nothing I have known - it's like an entirely alien experience, far removed from merely putting food in your mouth to fill yourself. It's like Archie Gemmil's goal against Holland being played out in your stomach over and over. Now forgive the name, because it sounds slightly poncy and it stikes up an image of what you'd normally expect of the area (quaint little tea rooms). No this is absolutely nothing of that sort, though it is a nicely decorated, comfortable place. The staff there are polite and very professional but the food? I still have dreams and I think of it when I'm stuck at work; never fails to make me smile. So you get the gist? I slightly like this place - I'd eat there every day if I could, but I'd be dead. 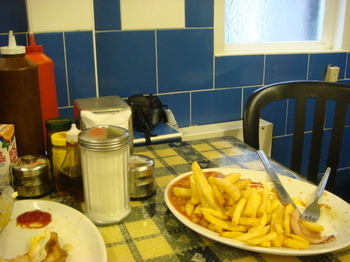 Right, so here it is - It's called Poppies Cafe...AND... it's in Ulverston (a small town right near the Lake District). So, if you're ever drawn to giving the Lakes a chance, even if it lacks good places for breakfast. I'm confident beyond arrogance that I have found the best place to eat. EBC&B is superb, worth the trip itself but the Full English is something even God wasn't prepared for. (disclaimer - no hyperbole was used in this piece). That's quite moving, not feeling able to order kippers for the sake of blog/title integrity. I used to drive past this café every day, but I think it was called Brekkers then. Or maybe that's another on the same stretch. Holy smoke. What a brilliant blog :) I'm buying your book for SURE. 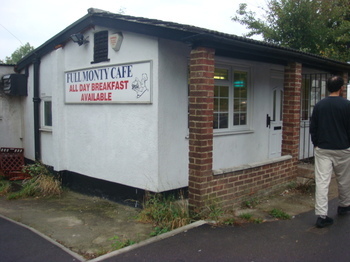 I've passed by Full Monty SO many times. Next time, I won't. I'm guilty of passing this one time and again. Often because I'm travelling with someone who does not share my fondness for such food. I think I'll have to make a pilgrimage one day.